Strengths: As a 6-8 versatile swingman, he has solid size and body to play the position, combining a remarkable wingspan and above average athleticism by European standards ... His athleticism and leaping abilities make him effective in the open court, both in offensive and defensive situations ... He uses screens and fakes to perfection to create space for shots or penetration to the basket, where he’s able to finish with either hand ... He’s an excellent spot up shooter, with both feet on the ground, showing excellent range ... His maturity and basketball IQ are really impressive, often playing as a point forward thanks to his handle, passing skills and court vision ... He can be considered a versatile offensive presence, as he excels in drive and dish, creating shots for his teammates ... His size makes him an excellent rebounder for his position (almost 5 per game this season), plus he’s able to guard frontcourt players, giving his coach great defensive flexibility ... He’s really effective playing passing lanes. Notes: Osman was MVP of last U20 European championship, leading Turkey to the gold medal (13.7 pts, 4.1 rb, 2.5 as). He has been member of the Turkish U-16 and U-18 National Team, he played at the 2011 European U-16 Championship and at the 2012 European U-18 Championship. He had 8 points and 5 rebounds during the playoff series in Euroleague against Real Madrid with a key role played. He has just declared he will stay in Europe for another two seasons, thus making him an ideal draft and stash pick. See you in 2017, guy!! You have fun the next couple years doing...whatever you do. 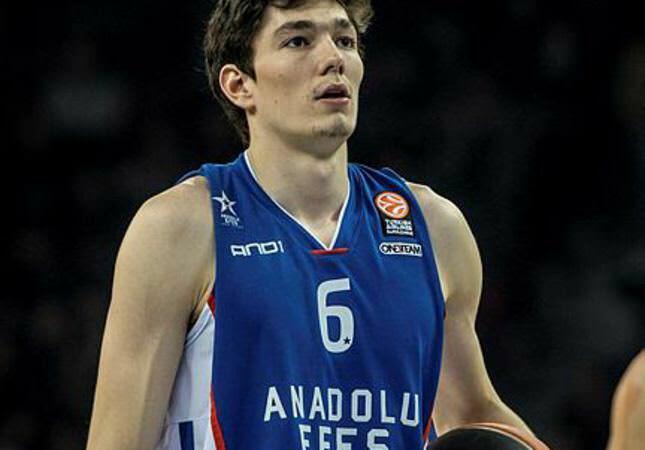 Cedi Osman is under contract for two more years and has stated his intent to finish his contract in Turkey before coming to the NBA in 2017. I expected Hernangomez, but I feel like a trade will be in the works regardless. Osman might be an asset in two years, might not. Hedefimiz olan finale adımızı yazdırdık. İnşallah sonu kupayla olur.. Destekleyen herkese teşekkürler. Nate Duncan and Chad Ford (I know) like him and like the Cavs' strategy. Not a surprising outcome given the Cavs tax situation. Much better than being stuck with a guy taken at 24 who wouldn't play who would be costing the team $5M per year. Would have preferred trading the pick for a future (protected) first. Maybe that wasn't available. Couldn't have said it any better myself, really. This feels a lot like when the Buckeyes sign a '18 football recruit. We'll see what you got after 3 years in the weight room. I like this dude already. Wait. What the hell is he talking about? What you say about my mama!!!!! !